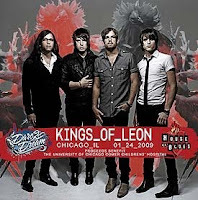 Bands, want a chance to open for Kings of Leon at their January 24 cancer research benefit show at House of Blues? Friday, December 5 is the final date to enter the competition at Sonicbids.com. Click here for more info. After the contest is closed, entries will be narrowed down to five and fans will vote at www.platform-1.com to choose the winner.